Details: Information about the LPN Program will be presented. Potential students will be able to ask questions and meet faculty. Information on the application process and financial assistance will be available. 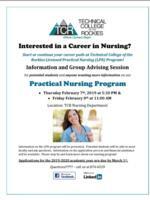 Please stop by and learn more about our nursing program. Applications deadline for 2019-20 is March 1st, 2019.